The program will support urban, small city and rural community redevelopment efforts by providing financial incentives for shovel-ready projects with emphasis on, but not limited to, downtown community-driven efforts. Funded activities should lead to measurable benefits in job opportunities, property values and/or leveraged investment by local and private partners. Grant recipients must provide a minimum 3:1 match investment in project costs. No more than 30 percent of the match investment may consist of other state and/or federal grant sources. Applicants must provide a signed resolution by the governing elected body authorizing the submittal of an application to the CDI Grant Program. Generally, applicants may only receive one CDI Grant per fiscal year; applicants within Designated Rural Counties may receive more than one grant per year, based on available funding. Applicants must demonstrate that all other funding mechanisms (CSBG, WI Disaster Fund, FEMA, etc.) have been evaluated and fully utilized before applying for WEDC CDI Grant funding. The grants will be limited to 25% of eligible project costs, with a maximum grant amount of up to $250,000. At least 50% of the funds will be awarded to cities/towns within Designated Rural Counties. Assist 12 communities and achieve 22:1 leverage of other investment. 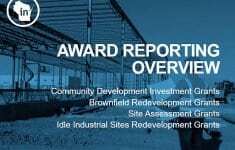 Recipients will be required to semi-annually submit a performance report document capital investment and assessed taxable property values, as well as any other contract deliverable. The CDI Program has a continuous application process. Applicants for a CDI Grant should complete an application through a regional economic development director. The completed application will be assigned to an underwriter and will go through the award review process. Download an informational sheet about Community Development Investment Grants. If you are interested in applying for or have questions about the Community Development Investment Grant program, please contact your regional economic development director.